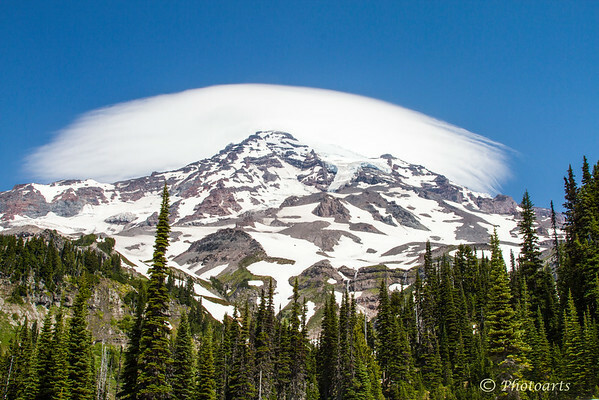 Mount Rainier is topped by a unique cloud type called 'lenticular' due to its lens like shape often forming above it's 14400 ft. peak. Several small waterfalls can be seen running off of its melting glaciers in this mid-summer capture. Beautiful capture the unique cloud pattern set it off. Thanks for looking and commenting. Superb image. The cloud frames the peak perfectly. I have only seen this type of cloud once, in the vicinity of the Grand Canyon. Thanks for the comment you left to one of my shots from the Grand Canyon. In answer to the question, whether it was HDR, no it wasn't. I did treat the sky and the canyon on separate layers in Photoshop, but nothing fancier than that.